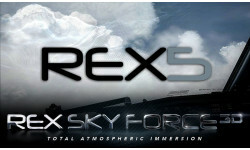 Search "REX Sky Force 3D" 2 results have been found. As part of the REX 5 family of products, Sky Force 3D adds true dimension and atmospheric immersion due to its complete overhaul of the weather, texture, effects, environment audio and cloud model SDK. Compatible with Prepar3D v1, 2, 3 and 4+, FSX Steam and FSX.